My astrological sign is Cancer. One major characteristic of Cancers is that we are homebodies. It’s not easy to pry us out of our homes for any significant length of time. For me, the best part of traveling is coming back home. Recently, I had to go on a trip for work. I went to California for a trade show. Given the things that have been happening with the Girly Girl lately, I was torn about leaving them and flying across the country. Luckily, we have Grammy to take care of my babies while I am away. Blue and Girly Girl absolutely adore Grammy. Grammy feels mutually about Girly Girl and with Blue, well, I think he may be growing on her. Let’s just say the jury is still out. It all stems from the very first time that Blue had a sleep-over at Grammy’s house. He apparently growled at Grammy when she went near him. This is very out of character for Blue. He hasn’t ever done this to me, or in my presence. 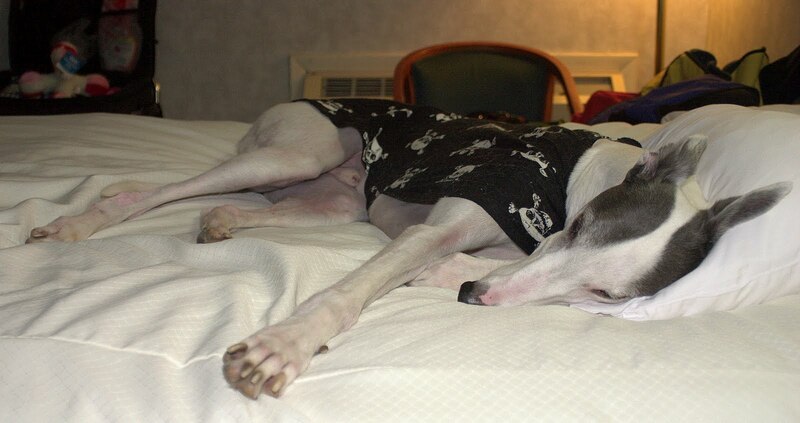 He’s known in the greyhound circles as a love bug. He’s never done it to Grammy again either. But he’s a big boy and it unnerved Grammy a bit. So she’s stand-offish when it comes Blue. Needless to say, Grammy was happy to see the backside of the four-legged grandkids when I came to pick them up. They were very excited to see mumma and that made me feel about as good as it is possible to feel and still be legal. As a Cancer, I’ve always loved coming home after a trip but now that Girly Girl and Blue are waiting for me when I get there, I wonder why I left at all. As for Blue, I think maybe Grammy was stretching it a bit. Blue behaves just fine for me. If I ask him to get off the bed, he does. If I ask him to step away from his food bowl, he does. I’m sure she’ll say it is all true but then, she’s a writer and leave it to a writer to make a big deal out of such a small event.